No, not Lincoln Logs - Wonky Log Cabin blocks. Remember this post and this post? Fabric has taken over the craft room! I found this blog: Quilt DAD. This is where I was introduced to the Wonky Log Cabin block. The very first thing that I loved about this block...it was WONKY!!! Un-even!!! It's the way that my quilt blocks were way back when I tried to do this before about 15 years ago and everyone kept telling me to rip it out and start over. This alleviates some of that stress, at least during the building part. 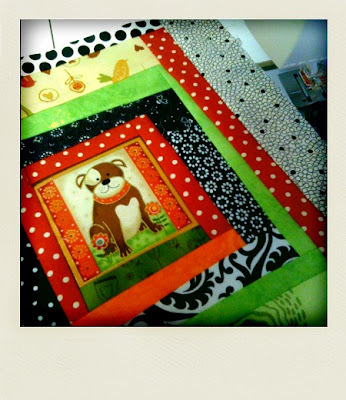 Plus all those 'fat quarters' I had been collecting over the years because I loved the fabric is getting used. I am having fun and putting together the blocks when I can! Then go to step two - 2. Prepping your fabrics. This was the best tutorial next to this one on how to fold your fabric for storage. On pre-washing...sometimes I do this and sometimes I don't. If it's old/vintage stinky stuff I definitely wash. Putting it all together for step 3. If you do a search on his blog for 'wonky log cabin' you will see other variations of this block. His directions and play by play photos are so helpful! As you can see my quilt is going to have a dog theme! The dog fabric is a line by Makower UK called Woof. All the blocks vary with different colors and fabric with the black and cream polka dots on the outer most area being consistent. Then each block is going to be sashed in black and put together for the quilt top. Speaking of dogs...I have received many emails in regards to not seeing my own furbabies lately on the blog. I am still writing about them but over on the Doxzen Pet Photos blog. You can also get there by clicking on the button over on the left. AND Jesse is on Twitter - follow him here.